The world around us is continuous – a rich array of surfaces, objects and people. Although we must interact with our surroundings to survive, we simply cannot perceive those surroundings all at once. Vision samples the world via successive eye fixations and movements of the head and body. Similarly, haptic exploration samples it via touch over time. Yet, these piecemeal visual and/or haptic inputs somehow give rise to a spatially coherent, meaningful, representation of a surrounding scene. How? Our lab takes multiple routes to understanding mental scene construction, with special emphasis on the revelatory value of memory errors and spatial distortions. 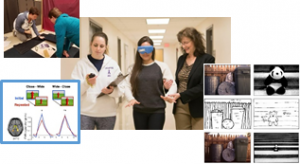 We address our questions from different perspectives – testing adults’ scene perception and memory, while also taking a developmental perspective by creating analogous tests for preschool children at UD’s Early Learning Center. Through collaboration we also take neuroimaging and neuropsychological approaches to understanding the constructive capabilities of the mind/brain. Our lab is open to prospective graduate students in Fall 2018. Feel free to contact me, Helene Intraub, at intraub@udel.edu if you interested in learning more. I look forward to hearing from you.